On 22 February, 2015, H.E. 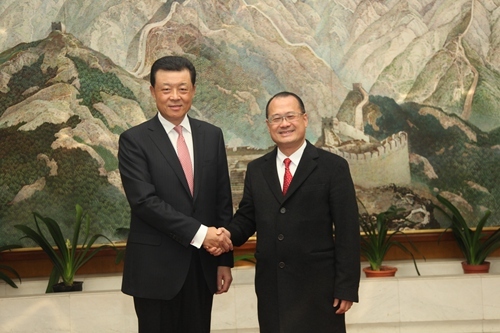 Ambassador Liu Xiaoming met with Chairman of the Chinese General Chamber of Commerce, Jonathan Choi Koon-shum and his delegation at the Embassy. H.E. Ambassador Liu Xiaoming reviewed the China-UK relations and spoke highly of Chairman Choi's support for the development of the motherland and China-UK people-to-people exchanges. He wished Chairman Choi success in his educational cooperation project in the UK and hoped that the project would contribute to a deeper China-UK relationship. Chairman Choi talked about his efforts in support of universities in China and cooperation projects with De Montfort University. He expressed willingness to play a bigger role in contributing to the development in China including Hong Kong and in pushing forward China-UK people-to-people exchanges and cooperation.